Everybody is familiar with Francis Cugat's original cover art for The Great Gatsby. It famously gives expression to lines from Fitzgerald's classic work -- lines that talk about Daisy Buchanan as the "girl whose disembodied face floated along the dark cornices and blinding signs." 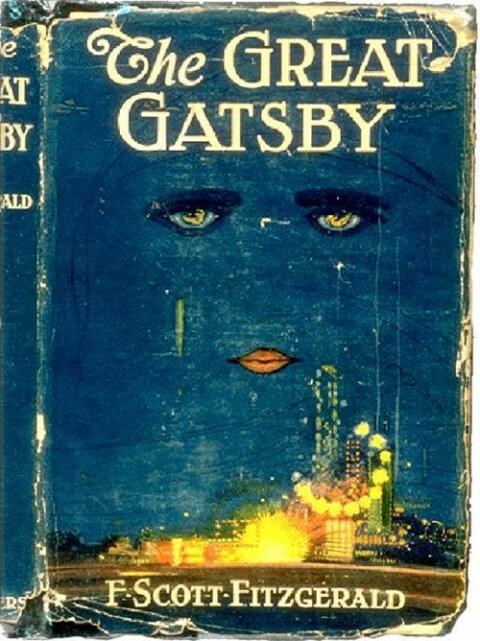 According to Charles Scribner III, the original publisher, Cugat created the design while Fitzgerald was still writing the novel, and when Fitzgerald saw the disembodied face, he couldn't resist writing the imagery into the book. Scribner quotes the author as saying, "For Christ's sake, don’t give anyone that jacket you’re saving for me. I’ve written it into the book." The Gatsby book covers all currently reside at the University of South Carolina, which houses other items that Fitzgerald held near and dear to him -- like his copy of Joyce's Ulysses, his leather briefcase, flask, and more. You can also find original dust jackets for Fitzgerald's other novels on the SC web site, including Tender is the Night, This Side of Paradise, and The Last Tycoon.